For me, time-management is a sort of foreign word. Every time I tell myself to do my homework quickly, I find myself on the night before at ten o’clock, with my eyes barely open. Ahhhh… I wish I could just be sensible and do it at a daytime hour. So, maybe you have an idea of 6th Grade life now. Thats what I really want to change. In 7th Grade, I am going to use my diary/planner proactively by bringing it to every class, writing down all my homework and review it at home. That way I won’t have to worry about time-management because I will be doing my homework the day the teachers give it (I hope). I think that getting to school on time and class on time usually isn’t a problem, thank goodness, but I really need to improve getting my homework done on time. Its not like I don’t complete every single piece of homework given to me just, unfortunately, the big projects. Well, that’s me. 2. Learn extra kanji and language skills outside of school. I think that I have worked hard to learning extra kanji and Japanese language skills outside of school – however, there is still a lot more to learn and do. I use workbooks like Utsushimarukun（写し丸君/Tracing Boy）which helps me improve my kanji and grammar by tracing and copying kanji, and kanji workbooks that I do page by page, sometimes once a month.The time I studied Japanese the most was probably during spring break after the earthquake at my grandparents house when I had lots of time on my hands where I did a page once a day.Recently, I haven’t been doing as much kanji work as usual because of the stress of the exams, report cards. I think that over the summer I will have to be stricter with study time. One thing that helps me is my Nintendo DS software that allows me to test my kanji skills, which I do after I finish kanji tests to see if I have really learnt anything. Improving my organization is a big thing for me. In the New Student Orientation, Mr. Snowball was explaining why organization is so important and it seemed like he was looking straight at me. He may have been slightly prophetic because during this year I have been on a roller-coaster of ups and downs of organization. Usually in the mornings before homeroom, I clean my locker and straighten all my binders, and by the end of the day it is messy again. This system works for me but sometimes I forget my class supplies, my diary, my pencil case, so I think this is an area I can improve in. I also need to bring the correct supplies for school but I think that this can be easily fixed – by using my diary!! Writing all the things I need and my homework will make my troubles fly away! Oh, yeah, and homework. I desperately need to turn my homework in on time. Next year I think that will be the big thing to work on. 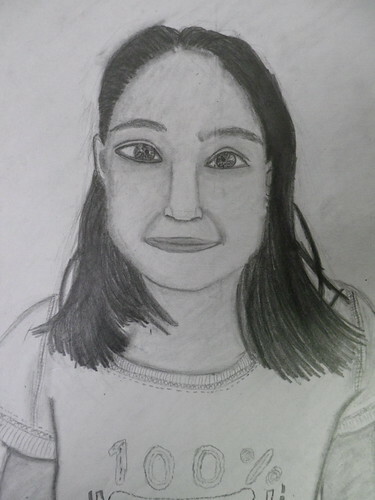 I drew this during my first semester; it is meant to be me, but, as you can probably tell (because it looks like a frog, not human) it looks nothing like me. 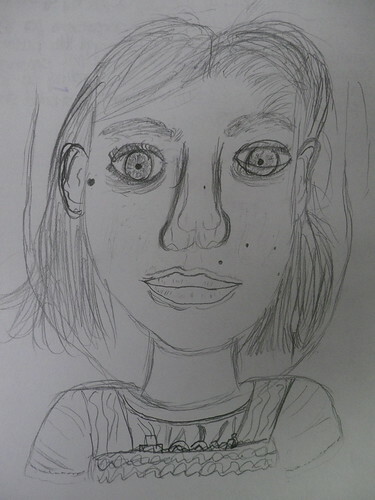 However, I am proud of it because you can see I improved from my from my first self-portrait. Can you tell which is which? Halloween Song from YIS Academics on Vimeo. A spooky halloween song to be played at scary parties. Made by Iruka with the help of Hye-won, in 6th Grade. Techniques for Memorizing Kanji from YIS Academics on Vimeo. In Humanities Class, to finish of the year we made a board game on one of the four topics we learnt about. My group (Emily, Kate, Nerissa, Me) chose Natural Disasters. I made this signpost on Photoshop – the original was a sign saying Welcome to the United States of America. It was really fun to edit, and it was also my first time using Photoshop, so I think that it is a good start. This is myself and Marii’s News Show. Unfortunately, it is all in Japanese, but I think that you can get the general gist of it. Note: one section of this News Show is MADE UP!!! BEWARE!! Iruka, What a great learning tool. I am sure you are enjoying learning with technology much more than the traditional way. You should thank your teacher for helping you have this experience.